Country Airs is a collection of solo piano pieces inspired by nature; I read somewhere that Rick Wakeman conceived them as a kind of nature walk. It marks Wakeman’s first foray into the field of new age music, although whether this constitutes true new age music (which implies a spritual bent that Wakeman likely never intended) or simply reflective instrumental music is open to conjecture. Recorded on a rich-sounding Bosendorfer grand, the songs on Country Airs are lovely, pastoral pieces with just a hint of the agitation associated with Wakeman’s earlier works. It’s a personal, sentimental side of an artist for whom the “less is more” aesthetic seemed virtually foreign. While the titles might strike fear in the heart of even the staunchest progger (“Dandelion Dreams,” “Waterfalls,” “Quiet Valleys”), take heart: this is Wakeman simplified, not bowdlerized. On more than a few occasions (e.g., “Morning Haze”), I was reminded of the old Wives’ tales in the clever phrasings and flourishes. I’ll confess, it isn’t without trepidation that I venture into the solo works of Rick Wakeman. An artist of his ability can produce such albums quickly and cheaply, with the attendant drop in quality those adverbs imply. Fortunately for us, Country Airs does not feel like a quickie cash-in on the new age phenomenon. Instead, these are solo piano pieces inspired by nature and informed by a natural genius. 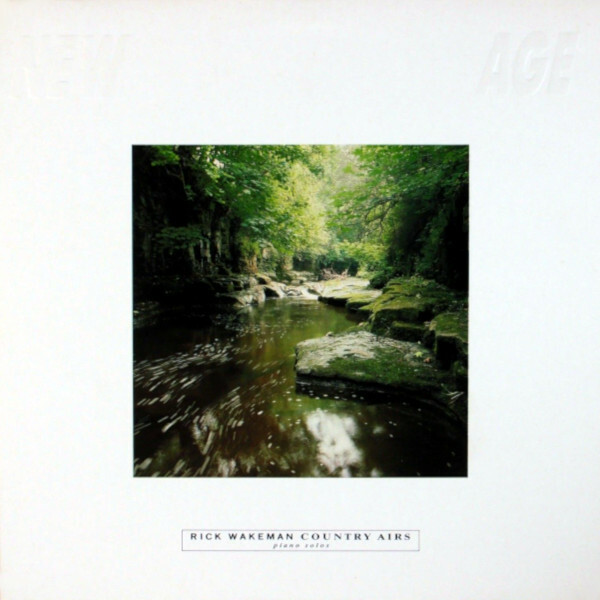 Coda cleverly saw an opportunity to cross-market Wakeman to new age audiences, and were rewarded for their efforts with the #1 New Age album in the UK. Wakeman enjoyed the experience enough to produce two full series of new age albums over the next five years (Airs, Aspirant). Certainly, playing solo music on a grand piano must have seemed like a walk in the park after performing rock & roll concept albums with a full orchestra. In 1992, Wakeman re-recorded this album, most likely to bring it under the same label (President) as the other Airs (Sea Airs, Night Airs). All songs written by Rick Wakeman. Rick Wakeman (Bosendorfer grand piano). Produced by Rick Wakeman; engineered by John Davis. Original cover photography by Charlie Waite. Original sleeve by Neil Cavagan. Released on elpee, cassette and compact disc in April 1986 in the UK (Coda, NAGE/NAGEC/NAGCD-10), Australia, Germany and the Netherlands (Coda, 830 510-1/4/2) and Japan (Coda, C28Y-0203 / Canyon, D32Y-0073); reached #1 on the UK New Age charts. Re-issued on compact disc in Australia (Dino, DIN339D) as part of the Art of Landscape television series. Re-recorded in 1992 and released on compact disc and cassette in 1992 in the UK and France (President, RWCD/RWK 10) with 4 additional tracks and unique cover. Original version re-released on remastered compact disc in 2017 (Rraw, MFGZ014CD) with 2 bonus tracks and unique cover.